BRP takes performance riding to the next level once again with the introduction of the new 300-hp Rotax 1630 ACE engine in the 2016 Sea-Doo RXT-X 300 and RXP-X 300 and the integration of the race-proven Ergolock seat on all RXT models. The new Rotax 1630 ACE engine is bigger, more efficient and delivers more power with a boosted 300 hp, becoming the most powerful engine ever produced by Rotax. The Rotax 1630 ACE has a longer stroke compared to the Rotax 1503 and features a new supercharger with a faster spinning 32-blade wheel producing 30% more intake boost1. Adding to the power producing efficiency is a reengineered cooling system that is improved by 33% in part from an additional heat exchanger and more efficient engine oil cooler. New ignition curves have been developed to efficiently match the increased air boost with the output of the larger fuel injectors leading to a 15% increase in horsepower and the industry’s best power-to-weight ratio in the 2016 RXP-X 300 model. This new engine also features a new plasma coating technology for aluminum-block engines developed by a Rotax team in Gunskirchen, Austria. The plasma coating technology is a thermal spraying process that deposits a protective coating on engine cylinder liners to create a metallic layer that provides a hard and durable surface to withstand piston friction forces. It improves surface durability, while keeping the engine lighter and more compact with better heat transfer and superior performance, and reduced use of chemicals. The race-proven Ergolock seat is now available on all RXT models for 2016 and allows riders to hold onto the watercraft better by using their stronger leg muscles to squeeze the narrower seat, thus improving control and reducing upper body fatigue. The 2016 Sea-Doo RXT-X 300 receives the complete Ergolock system that includes the narrow Ergolock seat, the Adjustable Ergonomic Steering (A.E.S.) handlebar and the angled footwell wedges for more rider comfort and control. All 2016 Sea-Doo performance models will be equipped with the second-generation iBR that improves on the industry’s first, intuitive braking system with a more responsive activation. The new iBR reduces the stopping distance by close to 48.75 m (160-feet)2 sooner than deceleration without braking. The Sea-Doo iBR system is the first and only braking system recognized by the USCG since 2009 for contributing to recreational boating safety and is now even better with a stronger gear drive motor and larger, reengineered brake gate. The iBR system adds to the rider centric design approach providing maximum control in all conditions. The 2016 Sea-Doo performance models also include race-inspired features such as high-performance Variable Trim System (VTS), increased storage capacity on RXT models, new handlebar grips with palm rest and race-inspired coloration and graphics. The combination of the increased power and efficiency of the new ROTAX 1630 ACE engine with the advanced ergonomics of the Ergolock seat deliver a confidence inspiring ride allowing you to push your limits even further on the 2016 Sea-Doo RXT-X 300. The 300-hp Rotax 1630 ACE engine delivers more torque providing more mid-range power to help maintain momentum when riding through heavy chop where the jet pump is continually reengaging the water. The new power package provides greater throttle response in all conditions and is the most powerful engine ever offered in a Sea-Doo watercraft. The RXT-X 300 model also benefits from the learning’s of the recent Sea-Doo closed course racing success as the race-proven Sea-Doo Ergolock system of the RXP-X has been adapted to this model. The system allows the rider to connect with the watercraft better and use his entire body to hold on rather than only the upper-body, thus improving confidence and reducing upper body fatigue. The narrower, body-molded seat, Adjustable Ergonomic Steering (A.E.S.) handlebar and angled footwell wedges, have proven to benefit in aggressive cornering and are equally beneficial in connecting the watercraft in choppy, open-water, straight-line riding. The added ability for the rider to feel better connected to the RXT-X 300 delivers better control and less fatigue allowing the rider to utilize the available power more efficiently. The addition of the Ergolock seat also aided in a redesign that now offers added wet storage under Sea-Doo’s exclusive removable watertight storage bin for over three times more storage capacity than the previous generation with 162 liters (42.8 US gallons) of total storage and a larger glove box. The technical flowing edges of the RXT-X model is complimented by the functionality of the stable and predictable S3 hull with adjustable rear sponsons. 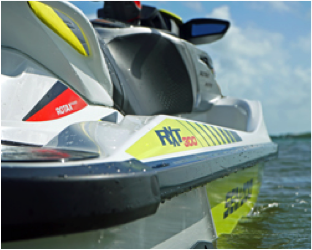 The RXT-X 300 watercraft is equipped with race specific features including, digital infocenter with integrated lap timer and boost indicator and high-performance Variable Trim System (VTS). It also features the second-generation iBR adding to the level of rider control with the most intuitive operation and Intelligent Throttle Control (iTC) systems with Touring, Sport and ECO modes. The 2016 Sea-Doo RXT-X 300 model is available in muscle colors of Lava Red and the modern Monolith Black Satin or race inspired White and Dayglow Yellow. The Sea-Doo RXP-X watercraft is the most decorated performance model in the last five years and is now powered by the new 300-horsepower Rotax 1630 ACE engine offering the industry’s best power-to-weight ratio performance. This new, stronger, bigger and more efficient engine takes the RXP-X 300 model to the next level as the industry’s undisputed king of performance fun. The Rotax 1630 ACE power package provides greater mid-range power for better cornering speed and produces over 1G during acceleration from a stop. The T3 hull design allows the RXP-X 300 model to aggressively lean into corners and penetrate chop better than any of its two-seater counterparts. T3 stands for “tight-turning t-hull” and uses an advanced, dual running surface hull design with a unique combination of soft and hard chines, adjustable rear sponsons and performance trim tabs. The T3 hull combined with the Ergolock system allows the rider to lean further into corners, using more of the available power, with greater confidence and less effort to turn tighter and faster. The Sea-Doo RXP-X 300 also receives the new handlebar grips with palm rest and intuitive second-generation iBR enhancing the level of rider control to complete the most intuitively controlled two-seater in the high-performance segment. The Sea-Doo RXP-X model has set the standard for precise handling and in 2016 is available in Lava Red and the modern Monolith Black Satin coloration or race inspired White and Dayglow Yellow. The Sea-Doo RXT-X aS 260 model is perfect for the hard-core rough water or offshore rider wanting adjustable suspension set on the wave penetrating S3 hull and equipped with the new Ergolock seat for added rider connection and control. The RXT-X aS 260 model features a high output, supercharged Rotax 4-TEC engine with race-inspired features, making this the ideal, open water performer. The Adjustable Suspension (aS) system features a compression-adjustable FOX damper and mechanical spring preload adjustment mechanism providing full rider suspension calibrated for heavy offshore conditions. The RXT-X aS 260 model boasts heavy sea condition enhancements including: adjustable trim tabs and bow stabilizers integrated with the S3 hull to give the rider greater stability and control at speed. Sea-Doo X-series watercraft are the only models equipped with standard race-inspired features including: custom steering system with A.E.S. and handlebar grips with palm rest, adjustable rear sponsons, and digital infocenter with boost indicator and lap timer. The RXT-X aS 260 model comes in new Lava Red and Monolith Black Satin coloration and also adds the intuitive second-generation iBR and adds iTC systems with ECO mode to compliment the most full-featured performance watercraft in the industry. BRP’s 2016 Sea-Doo RXT 260 model is ideal for the weekend performance enthusiast looking for an exhilarating experience during longer rides. The new Ergolock seat is now available on the RXT 260 model for added control, comfort and confidence in all conditions with a form fitting design for the driver and passengers. The 2016 RXT 260 with new Ergolock seat also aided in a redesign that now offers added wet storage under Sea-Doo’s exclusive removable watertight storage bin for over three times more storage capacity than the previous generation with 162 liters (42.8 US gallons) of total storage and a larger glove box. The 2016 Sea-Doo RXT 260 model comes equipped with all the benefits of the Sea-Doo exclusive iControl technologies including new second-generation iBR for more responsive activation and faster braking. The exclusive BRP iTC system allows customizable power delivery modes including ECO mode. The RXT 260 model features the S3 hull for improved handling and stability, touring and sport mode calibrations for linear power delivery or more aggressive acceleration, tilt steering with integrated digital infocenter, high-performance VTS, hinged seat for easy engine access, watertight removable storage bin and fuel consumption displays among many more. The 2016 RXT 260 is available this year in Black and Sunburst Yellow coloration. The 2016 Sea-Doo GTR 215 model is arguably the most versatile performance model in the industry by lowering the barriers for enthusiasts to enter the Sea-Doo performance family with more technology and flexibility than comparable competitor watercraft at an affordable price. The GTR 215 model is the preferred model of choice for 250 class as the reigning AQUAX US 250 class champion3. This model is based on the nimble yet predictable handling of the GTI platform while offering more power from its supercharged Rotax 4-TEC marine engine for a superior power-to-weight ratio. The 2016 Sea-Doo GTR 215 will be spotted in the lead pack in Black and Sunburst Yellow coloration. The GTR 215 watercraft is also fully equipped with the Sea-Doo iControl technologies including the iTC and second-generation iBR system, allowing the rider to reduce the stopping distance by close to 48.75 m (160-feet) for greater peace of mind. The Sea-Doo GTR 215 features: integrated infocenter, high-performance VTS and 116.6 liters (30.8 US gallons) of storage. Nashville, Tennessee Sept. 18, 2015 – BRP charges into 2016 building on the successful launch of the Sea-Doo SPARK as the industry’s most accessible watercraft and introduces new technologies and designs that take riding to the next level emphasizing the Sea-Doo legacy of being on the forefront of innovation. BRP continues to perfect the Science of Fun with the introduction of the new 300-hp Rotax 1630 ACE engine powering the 2016 Sea-Doo RXT-X 300, RXP-X 300 and GTX Limited 300 models and adding the Ergolock seat to all RXT and GTX models with many models receiving a redesign of the storage area providing up to three times the overall storage volume. All 2016 models will now have the new second-generation iBR (intelligent Brake & Reverse) system and new, trend leading coloration including three new delicious colors for the 2016 Sea-Doo SPARK. To feed the larger engine more air a new, re-designed supercharger with a faster spinning 32-blade wheel (double the blades of the previous version) has been added producing 30% more intake boost. A new larger intercooler provides a more dense air charge and aids in increased airflow and features a new air fin design for improved heat transfer utilizing a smart design with long life aluminum alloys for better corrosion protection. New ignition curves have been developed to efficiently match the increased air boost with the output of the larger fuel injectors leading to the 15% increase in horsepower in the 2016 Sea-Doo RXT-X 300, GTX Limited 300 and RXP-X 300 models. The 2016 RXP-X 300 sets the new standard at the next level now with industry’s best power-to-weight ratio. BRP designers have applied the science of rider centric ergonomics learned in the laboratory and from the recent Sea-Doo closed-course racing success as the race-proven Sea-Doo Ergolock seat of the RXP-X model has been adapted to more models for 2016. The Ergolock seat is optimized to fit a variety of riders and utilizes a narrower, slim profile design between the legs with body-molded knee pockets allowing riders to sit in a more natural position and leverage leg muscles to grip the watercraft. It also allows the rider to connect with the watercraft better and use the entire body to hold on rather than only the upper-body, thus improving comfort, confidence and reducing upper body fatigue. The new Ergolock seat is available on all Sea-Doo RXT and GTX models and the WAKE PRO 215 model. On the RXT and WAKE PRO 215 models, the Ergolock seat lets riders leverage leg muscles to grip the watercraft for better control. The GTX models feature the Ergolock seat with stepped design for more comfort while touring and confidence while turning. The stepped design implements sculpted, rising seat levels for better passenger vision and lateral support. Added surrounding lumbar cushioning for up to three riders holds them in place better with more comfort in all conditions. The 2016 Sea-Doo RXT-X 300 receives the full Ergolock system. In addition to the sculpted seat optimized for better transition between sit-down riding and standing, it includes the Adjustable Ergonomic Steering (A.E.S.) handlebar and angled footwell wedges, that have been proven to benefit in aggressive cornering and are equally beneficial in connecting to the watercraft in choppy, open-water, straight-line riding. The added ability for the rider to feel better connected to the RXT-X 300 delivers better control and less fatigue allowing the rider to utilize the available power more efficiently and more confidently. The WAKE PRO 215, non-suspension RXT and GTX models with new Ergolock seat also adds wet storage under Sea-Doo’s exclusive removable watertight storage bin for over three times more total storage capacity than the previous generation with 162 liters (42.8 US gallons) and a new larger glove box. All 2016 Sea-Doo models will be equipped with the second-generation iBR that sets the standard for intuitive operation and improves on the industry’s first braking system. The new iBR allows you to stop close to 48.75 m (160-feet)1 sooner than deceleration without braking. The Sea-Doo iBR system is the first and only braking system recognized by the USCG since 2009 for contributing to recreational boating safety and is now even better with a stronger gear drive motor and larger, reengineered brake gate. The intuitive iBR system adds to the rider centric design approach providing maximum control and a more natural reaction in all situations. All 2016 Sea-Doo models will be equipped with new handlebar grips that feature a flared surface acting as a palm rest for a better ergonomic fit for the hand added comfort during extended riding. The Sea-Doo SPARK continues to be the industry’s most accessible and affordable watercraft making the dream of owning a watercraft possible now. The Sea-Doo SPARK has contributed to 20% industry growth in its introduction year2 and returns in 2up and 3up3 models and is available with the Rotax 900 ACE and Rotax 900 HO ACE marine engine packages. In 2016, the Sea-Doo SPARK is easy to personalize with three new delicious colors; Blueberry, Key Lime, and Chili Pepper, joining the Pineapple and Vanilla colorations and six new graphic kits expanding on the dozens of graphic kit options available. For 2016, models equipped with the iBR system will also come with the Convenience Package Plus that includes the Sea-Doo SPARK Front Storage Bin Kit that flows with contours of the design, the Sea-Doo Step for easier reboarding and the Digitally Encoded Security System (RF D.E.S.S. Key) that allows for greater security from theft and unauthorized use. The Sea-Doo SPARK watercraft is more affordable4 and more fuel-efficient5 than any other model in the industry. Plus, the durable Polytec material of its hull and deck is solid while being recyclable, making it a more eco-friendly watercraft. The compact design of the Sea-Doo SPARK and lightweight construction makes it easy to own, easy to tow, simple to store and a blast to ride. The engineering and design team at Sea-Doo introduces the leading edge Element Jacket and Pants for 2016, offering riders warmth and protection to extend riding season beyond the summer months. Brand advocates of both genders will transition from land to water in chic styling. The windproof material with Teflon water-repellent treatment has a laminated membrane that is designed to be both water resistant and breathable. For added comfort during colder days, the jacket and pants are lined with brushed-knit polyester thermal fleece. A relaxed fit allows enough room for the rider’s favorite Sea-Doo boardshorts and the pre-shaped legs are designed for multiple riding positions. The Element Pants add on to the functionality and styling of the Element Jacket with additional exterior pockets to carry essentials. The new Element Jacket and Pants offer Sea-Doo enthusiasts casual and functional gear that matches the unique design of Sea-Doo watercraft and will get their hearts pounding. 2 Based on retail sales of the PWC industry. 4 Source: Manufacturer’s website. Prices vary according to product specification. 5 Based on BRP internal testing. Testing of competitive model done under identical conditions.